In the last year, while the Government has pursued an economic austerity policy and propagated a rhetoric of ‘benefit scrounging’ and ‘undeserving poor’ (a very old rhetoric of the rich talking about the poor, as Mary Beard has reminded us – also listen here), the number of food banks in Britain has doubled to more than 3000. In 2011-12 more than 130,000 people were helped by food banks, that number is rising rapidly (on the back of energy price increase that leave ever more people worrying about being able to pay their bills), with hundreds of volunteers spending part of their Christmas distributing food and trying to tackle the ‘hidden hungry’ who won’t accept free food because they feel stigmatised by the need for it. Meanwhile a report by the Resolution Foundation argues that millions of Britons face a ‘financial precipice’ in a time of stagnant wages and high household debt. Yet most of the government cuts have yet to bite. One might hope that the citizens of the UK would support their poverty-stricken compatriots in this climate. After all, we no longer live a context in which the poor are silent and only the rich write the news. Articulate blogs such as ‘Diary of a Benefit Scrounger’ and ‘Benefit Scrounging Scum’ provide views from the sharp end. Yet the British Social Attitudes Survey reports that attitudes towards welfare recipients are hardening and only 28% of those asked wanted to see more spending on welfare – down from 35% at the beginning of the recession in 2008, and from 58% in 1991. In this respect, at least, the Coalition government seem to be in tune with popular opinion. It is, no doubt, an excellent thing that many people will spend part of their Christmas helping the less fortunate – but poverty isn’t just at Christmas, and it is a problem likely to get considerably worse before it gets better. If Santa was a registered voter…. “In your opinion if Santa Claus was a registered voter, what political party would he most likely support?”. Some 26% thought Santa would be a Democrat supporter (perhaps reflecting his ties to to social welfare), while just 15% thought Santa would be a Republican (keeping in mind Santa only brings presents for children have been good each year, suggesting a strict social conservatism behind his charitable facade). Far more, 43%, thought Sanda would be an independent, standing above the partisan rancour of politics (with some 16% unsure). We still don’t know, however, whether Santa’s schedule for this year includes a stop-off in Congress to solve the partisan impasse over the ‘fiscal cliff’, with hard-line elements of the Republican Party stubbornly refusing a compromise. Santa has sadly not been immune to the growing polarization of US politics in recent years. In December 1998, Fox News/Opinion Dynamics asked a similar survey question “Do you think Santa Claus would be a Republican, a Democrat, or an Independent?”. In contrast, just 9% of people thought Santa would be a Democrat and 6% a Republican, with 62% suggesting he would be an independent. In just three years a quarter of the US public had taken a more polarized stance on poor Santa. It is only a matter of time before polarization occurs in judging who has been naughty and who has been nice. UPDATE: A Public Policy Polling survey earlier this month asked “Do you think Santa Claus is a Democrat or a Republican?” This time 44% of the US public thought Santa is a Democrat and 28% a Republican, with 28% unsure. The polarization of Santa Claus continues… (or perhaps the public are more informed about Santa’s policy positions these days). Happy Holidays from Politics|Upside|Down and Politics & International Relations at the University of Southampton. A guest post by Bryan Jones, J.J. “Jake” Pickle Regent’s Chair in Congressional Studies at the University of Texas at Austin. Cross-posted at The Monkey Cage. Also see Bryan’s interview about policy change with The Huffington Post. win most seats at the election. 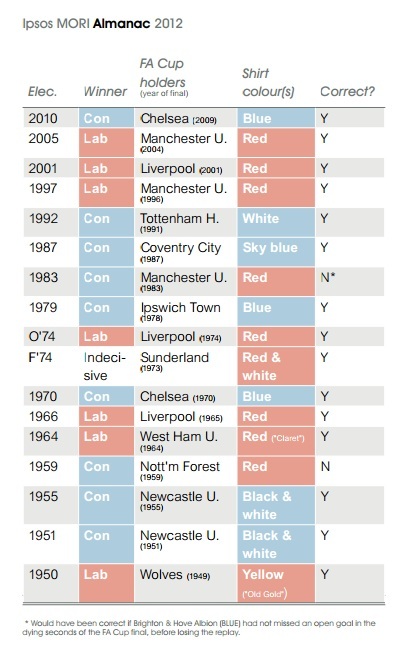 On the other hand, if they play in Labour’s colours, red and/or yellow, Labour wins. (Ipsos-MORI Almanac 2012, p. 52). Using this method (and with a bit of selective/liberal interpretation of the data), Mortimore’s Sweet FA model is able to correctly predict the outcome of 15 out of 17 post-war elections (and 4 out of 4 London Mayoral Elections). Election forecasting is not an exact science, and the Sweet FA model provides a nice reminder that successful predictions are not always based on a correct diagnosis of the underlying causal relationship. While forecasters like Nate Silver (and Paul the Octopus) can develop mythical status in offering highly accurate predictions of future events, these do not necessarily guarantee the prediction model will work in future, or that some outlier will lead to it being rejected further down the track. In a recent article published in Journal of European Public Policy, Dr Kamil Zwolski of Politics & International Relations argues that there are two important norms in European Union’s (EU) external policy which in fact may be in conflict. The EU aspires to become a truly comprehensive international security actor, coherently utilising the different kinds of instruments at its disposal. To this end, Lisbon Treaty reforms aim to equip EU policy with a stronger sense of strategic direction by bringing external assistance instruments of the EU under the guidance of the High Representative. However, pursuing the norm of a more holistic, strategic international security policy has arguably threatened a key norm which contributes to the EU’s normative identity, namely the apolitical character of its aid. Kamil’s article explores the friction between these two norms in the EU’s international policy, particularly in the context of the arrangements concerning the European External Action Service. Furthermore, he argues that the gradual move towards a more strategic deployment of the EU’s external assistance is inevitable, as it reflects the strategic principles defined by the EU in the last decade.